Kakatiya University M.Phil/Ph.D Entrance Test Hall tickets,Results 2017, Kakatiya University M.Phil/Ph.D Entrance Test Notification 2017: Kakatiya University M.Phil/Ph.D Eligibility Test 2017, Kakatiya University M.Phil/Ph.D courses Admission Notification 2017: Kakatiya University M.Phil/Ph.D Entrance Test 2017 Notification has been issued by the KU, Warangal Officials on 05th February 2017. KU Directorate of Admissions invites applications through Online mode from the eligible candidates for M.Phil/Ph.D Entrance Test 2017 in various subjects under different faculties of Kakatiya University. 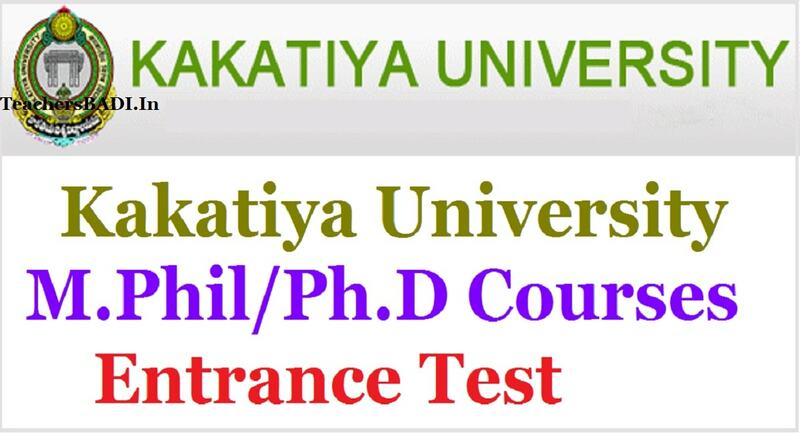 M.Phil/Ph.D Entrance Test is one of the eligibility criteria for admission into M.Phil/Ph.D programmes offered by Kakatiya University in different subjects in the faculties of Arts, Social Sciences, Commerce, Management, Education, Law, Science, Oriental Languages, Engineering, Pharmacy, Technology and Informatics. The Kakatiya University has released notification for admissions into MPhil and PhD programmes offered by the university. The University is offering PhD programmes in arts, commerce and business management, education, engineering and technology, law, pharmaceutical sciences, science and social sciences. In case of MPhil, subjects that are offered include economics, history, human resource management, political science, public administration, sociology, Telugu, English, Commerce and Business Management and Education. The MPhil entrance test will be held on March 24 and PhD test on March 25. Eligibility: Candidates appearing for PhD and MPhil tests should have master’s degree in concerned subject with a minimum of 55 per cent marks (in case of SC/ST/PH it is 50 per cent). Registration: Candidates can apply online at http://www.kakatiya.ac.in or http://mphilphd.kudoa.in/ . Fee: The PhD registration fee is R.1000 (Rs.750 for SC/ST/PH) and Rs.700 (Rs.500 for SC/ST/PH candidates) for MPhil registration. Deadline: Last date to apply is February 28 without a late fee and with a late fee of Rs.500 it is March 10.
a. Candidates must have obtained a Post Graduate Degree, from a recognized University in the concerned subject or in an allied subject approved by the University securing not less than 55% marks at the Post Graduate Degree and securing not less than 50% marks in the case of SC/ST candidates. If the results of Post Graduate Degree are declared in the form of grades/ credits/cumulative grade point average in their marks cards/transcripts, such grades/points shall be converted into percentage of marks to assess the minimum eligibility criteria. b.The candidates must have been awarded a research fellowship through a national level test such as UGC-CSIR/ ICMR / ICAR /DBT /JRF fellowship/ and Teacher Fellowship applicants subject to clearance by the RAC, KU. The candidates, who do not have any fellowship and have cleared qualifying exams i.e., NET/ TSET/ GATE/ JEST etc., are directly admitted into Ph.D. programme subject to clearance by the RAC, KU. The candidates with ICSSR/ RGNF/ MANF/DST-INSPIRE/ NIN- JRF/ICAR/IICT-JRF awarded by national level bodies/ institutes, Project Fellows etc., having NET/TSET/GATE/Joint Entrance Screening Test (JEST) or any other equivalent Ph.D. eligibility test qualification are also admitted directly to the Ph.D. programme. Those who have any fellowship but do not have any eligibility test qualification are also admitted directly into Ph.D., subject to the condition that they must clear NET/TSET/ other Ph.D. Eligibility Test as decided by RAC within two years from the date of admission into Ph.D. programme. c.The candidate with an M.Phil. or an equivalent degree from a recognized University shall be eligible for direct admission into Ph.D. programme. The eligibility test will be of 90 minutes duration and question paper consists of 100 objective (multiple choice only) type questions. The eligibility test will consist of any 3 or 4 varieties of objective type items such as analogies, classification, matching, comprehension of a research study / experiment / theoretical point of view, etc., with multiple answers besides the usual multiple choice items. The items will be framed only from the syllabus of eligibility test. Nature of test: Objective type with multiple choice questions. Medium of eligibility test: The medium of eligibility test will be English only except for language subjects. Submission of Application Commence from: 07.02.2017. Last date for submission of Application without late fee : 28-02-2017. Last date for submission of Application with late fee of Rs.500/- : 10-03-2017. The results of PhD and M.Phil conducted by Kakatiya University were released on 22-06-2017. Entrance examinations were held on April 11 and 12 for the 27 courses in PhD and MPhil in 10 departments. 8,519 candidates were attending the M.Phil and Ph.D courses and 5,171 candidates are qualified, 60.07 per cent passed in the examination. For OMR Answer Sheets - 2017 visit the KU Research website: http://research.kudoa.in/.